IHT9 Anti Hair Loss Kit (Hair Oil + Shampoo + Conditioner) - Blend of 9 Rare Herbs for the hair regrowth and the Best anti Hair Loss Therapy. IHT9 brings you the first herbal formulated three-pronged approach for treating hair related problems naturally. Comprising popular hair regrowth shampoo, oil, and conditioner, this Ayurvedic IHT9 Kit is recommended by dermatologists around the world as an Intensive Hair Therapy. * Effective Solution for both Men and Women. * Formulated with the most powerful Ayurvedic Ingredients. 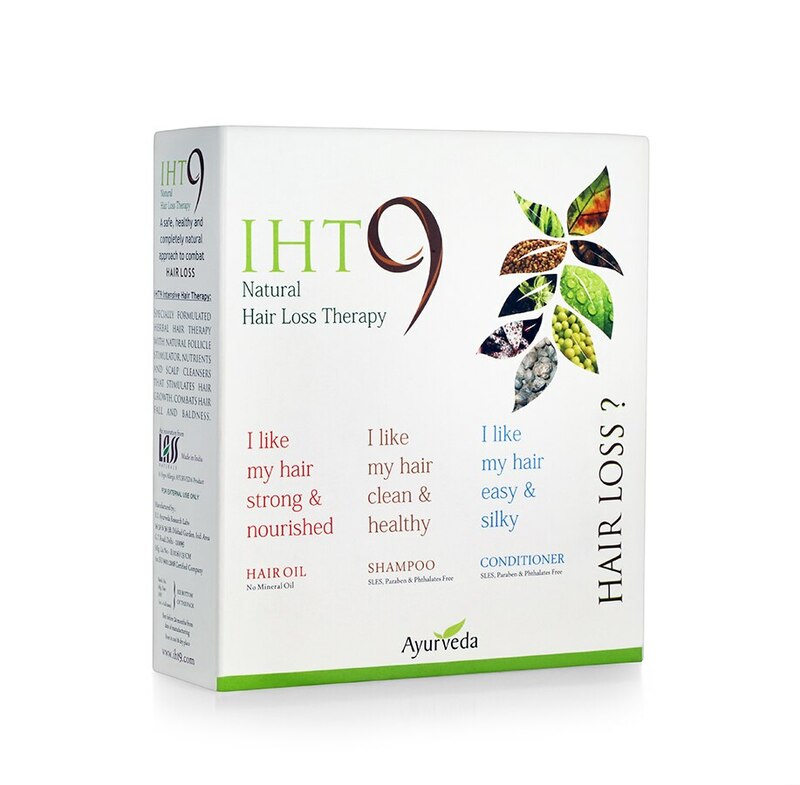 * IHT9 Anti Hair Loss Therapy is a natural, safe, effective and ayurvedic remedy for common hair loss problems * Free from SLES, Paraben and Phthalates * Comprehensive Hair Treatment Therapy * Cures Hair Loss, Thinning, Dandruff and other scalp related issues * Contains Hair Oil, Shampoo and Conditioner Regrow Thicker, Stronger And Healthier Hair with IHT9 Hair Loss Prevention Kit! IHT9 Anti-Hair Loss Treatment Kit is recommended for: - Severe Hair Loss Problem - Thinning of Hair and Baldness - Recurrent Dandruff - oily and Itchy Scalp - Oily Hair associated with other hair disease HT9 KIT does not contain any product that interferes with hormonal balance (or imbalance) of your body. And therefore, is the SAFEST remedy for hair regrowth. - Provides essential nutrients that minimize continuous hair loss - No build-up residue - Creates an environment conducive to hair regrowth - Composed of botanical and herbal ingredients - 100% Safe with NO SIDE EFFECTS - No parabens, petrochemicals, SLES free - Equally effective for both Men and Women - Contains No Synthetic Colors or Fragrance - Hypoallergenic Product - Authentic Ayurveda - No Animal Testing - Affordable priced and honestly marketed Manufacture of Organic skin care and hair care products in Delhi.